Current version only supports single subject in .v file. OSX version does not provide application configuration dialog at the very beginning of app run. It means that you can only use a specific resolution (1024x768 as windowed mode). This issue is due to the limit of current OSX Ogre framework. You can manually change this configuration. See details here. For your convinience, here are several sample data available to download. Each character directory inlcude .mesh, .skeleton, .map and necessary material files. Some character models are exported from MotionBuilder Character ClipArts. Each Motion directory includes .v and .vsk file. * .map (character mapping) file details here. To compile motion viewer application, Visual Studio 2005 (windows) or Xcode 3.0 (OSX) is required. External libraries are inlcuded in source distribution for windows platform (Ogre and Xerces library in ext directory. On Mac, you need to download libraray separately). Refer to README file in source distribution for more instruction to build application from source. Application usage is pretty much straight forward. If you saw demo video, you know that it's not such complex piece of software at all. Windows: double click MotionViewer.bat in root directory of application (this is simple batch to execute build/Win32/Release/MotionViewer.exe for your convinience). Configure application setup in OgreConfigDialog window. * To terminate application, press ESC key. Use combination of alt key and mouse button drag. (Holding down alt key and drag mouse with button down). Since Mac has slight different behavior for alt modifier key, mouse constrol is different from Windows version. On right top of screen, there is menu title bar (MotionViewer Menu). Doble click on this title bar to roll down / up menu. Menu has two control tabs, MotionData and Character. On each tab, you can load and change data. On MotionData tab in menu, click Load New V file button. Then, click OK button. 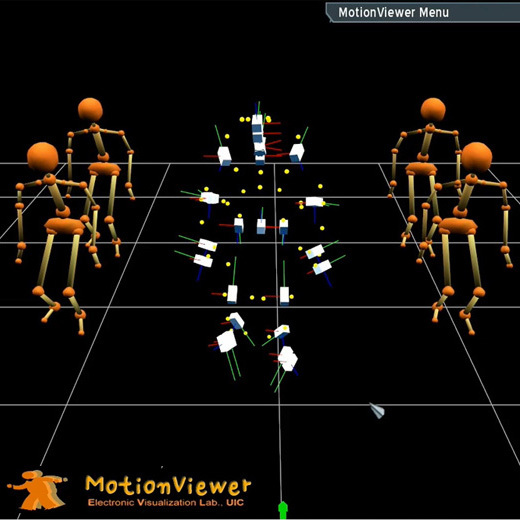 You will see your motion data is loaded and markers and bodies moving accordingly. On Character tab, click Load New Character Button. If you loaded motion data and character already, you can make connection (mapping) between them. On Character tab, select you character (combobox). Click Connect motion "Change?" button. Select motion data set (combobox) and load mapping file (.map file). 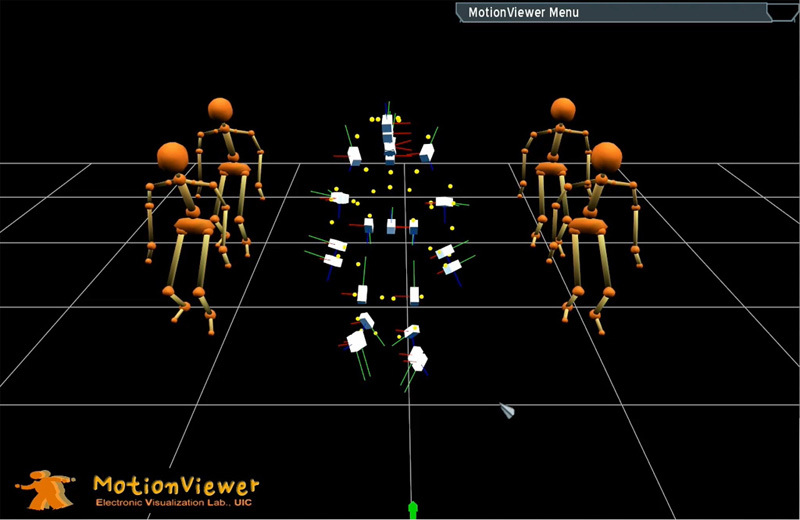 Now, you see your character moving based on specified motion data.